College students of Long Island, listen up! Your time in academia will be coming to a close before you know it, and whether you’ve just started your freshman year, or are wrapping up your senior thesis, it’s never too early or late to start planning for the day after graduation. After all, when those graduation gowns and mortarboard hats come off, you and your classmates are going to be competing for jobs and careers out in the real world. And like it or not, a quality car is a major asset when it comes to securing your spot and climbing the corporate ladder, especially here in Long Island. Lucky for you, your diploma can also net you a great deal on a BMW car with our College Graduate Program here at Competition BMW of Smithtown. With the BMW College Graduate Program, you can save up to $1000 dollars on the purchase a new BMW, or up to $1,000 on the purchase of a Certified Pre-Owned BMW model when you finance through BMW Financial Services. Best of all, with the BMW College Graduate Program, you’ll not only have the opportunity to save quite a bit of money on your purchase, but also to enjoy some of our most popular BMW models. We happily carry a comprehensive stock of some of the most sought-after BMW cars for sale here in Long Island, including the full range of the BMW 3 Series, BMW 4 Series, and BMW 5 Series with available xDrive all-wheel drive capability. From behind the wheel of one of these exquisite BMW models, we have no doubt that you’ll be ready to take on whatever post-graduate life throws your way here in Long Island, and the best way for you to get behind the wheel is to take advantage of our BMW College Graduate Program before the opportunity passes you by. Feel free to visit us at Competition BMW of Smithtown to learn more this program from our friendly, knowledgeable sales associates at your earliest convenience. 1. Offer subject to credit approval through BMW Financial Services and verification of graduation and employment. Recent graduate means graduation from an accredited college or university with a doctorate, graduate, undergraduate, or associate’s degree earned within the previous 24 months, or is eligible to graduate within the next 6 months and has a verifiable offer of employment. To qualify, you must have a minimum of 6 months of credit on file and no previous derogatory credit on any credit lines. Finance and lease terms based on credit score. See your BMW Client Advisor for most current program. 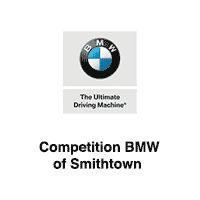 Offer subject to change or be withdrawn at any time and without notice – call Competition BMW of Smithtown to confirm current offerings.